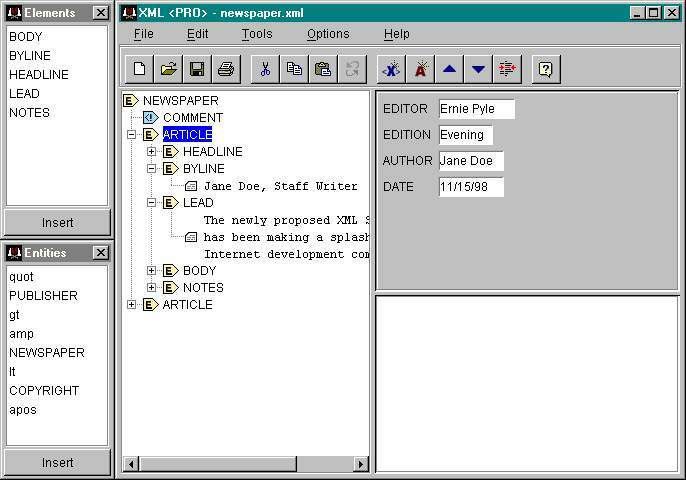 "XML Pro is a top-notch XML editor..."
"XML Pro's combination of developer-oriented editing features and affordability makes it a good addition to your XML toolkit." If you need a stand-alone editor for XML, you've come to the right place! XMLPro is the perfect solution for editing your XML files. Download a copy to try it out today! If you are having trouble downloading, installing, or using XMLPro, please download a copy of the user guide, or contact our technical support staff with as many details about your issue as possible. XMLPro is free to individuals, not-for-profit organizations and educational institutions. Business and commercial users should contact Vervet for commercial licensing information.